J.J. COMER – UK 13th November 1912. Automatic Enunciator Co. – sound is transmitted electrically. Comer is referred to. Compton’s story starts here with a sound magnifying attachment. Specifications of inventions by Charles Parsons are referred to. Also an invention by G.C. Marks, an invention for magnifying sound applicable to phonographs and telephone relays is referred to. This also referring to an invention by D. Higham in 1901 classified under Electric Telegraphs for an apparatus for producing magnified sound. Compton later makes quite a unique claim in a 1929 patent specification. A device is outlined where each string may be individually amplifed using electro-magnets attached to electrical amplifiers and speakers. The described patent is an addition to one granted to Compton between 1921&`23. The earlier patent is described as “the vibrant medium” which the device “picks up”. Giant-Tone Radio Violin ( special pickup fitted in the f-hole of a normal instrument ). Electrical oscillations being amplified and transmitted to a sound-producing or radio-transmitting device. Open to inspection see Compton. A reverberator for attaching to bridge. 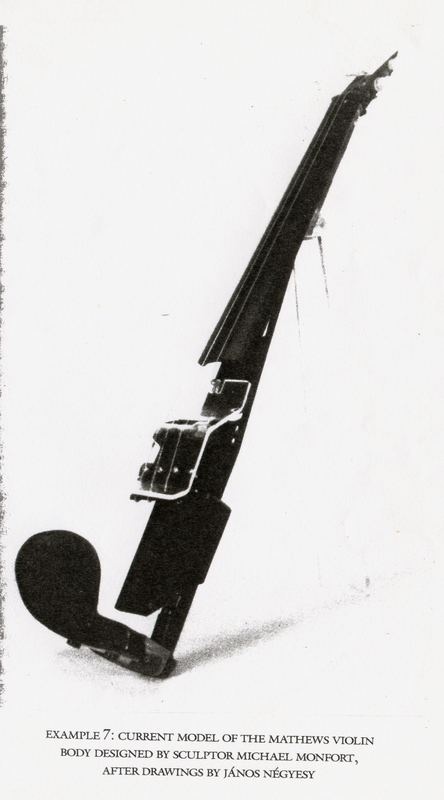 Superviolon special pickup attached to a normal instrument, with associated circuitry that enabled it to play in the ranges of all bowed strings. Oskar VIERLING. Berlin, GERMANY c1931. Elektro-Geige – an electroacoustic violin. 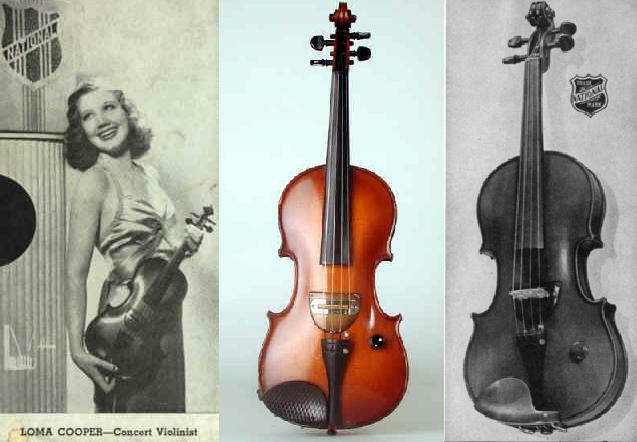 click on the link to see image of Vierling’s violin invention. Vierling was born in Straubing, Lower Bavaria on the 24th January, 1904. He was a German electroacoustic engineer and instrument inventor. He began to work on acoustics research and the development of electronic instruments at the Heinrich-Hertz-Institute. 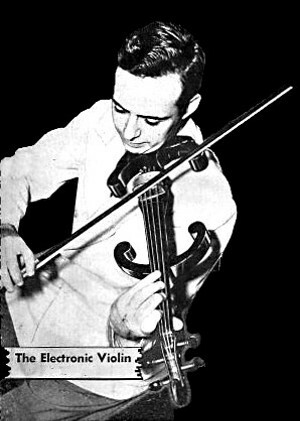 Vierling’s work on electronic instruments has been divided between oscillator-based electronic organs (and related instruments) and electro-acoustically amplified string instruments, building an electroacoustic violin and cello in 1931. These instruments are played in the usual way, but instead of the tone of the strings being amplified acoustically by a sound-board, as in the normal instruments, the vibrations are picked up by electro-magnets (one for the fundamental tones and another for the harmonics), conveyed to an amplifier similar to that of a radio set, and issued through a loud-speaker. By manipulation of the amplifier concerned with the harmonics the timbre can be varied; thus the violin can be made, for instance, to sound like an oboe. From searches on the internet it appears that these instruments formed part of an “All Electric Orchestra” and were recorded onto gelatine in Berlin, 1936. The records were recently transferred to CD. 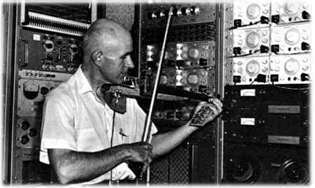 Until these recordings are made available the Vierling electric stringed instruments will remain in obscurity. 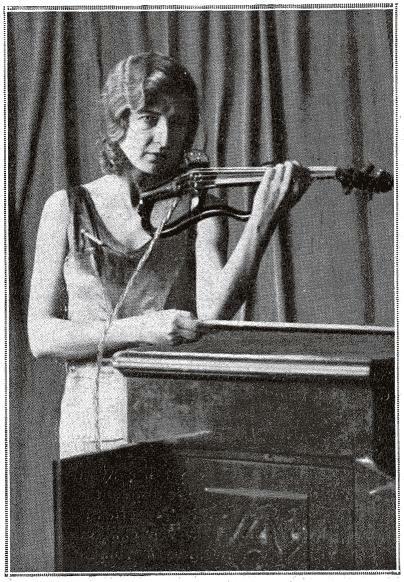 From the extreme scant photographic evidence available, it appears that Vierling used a “silent” practice violin and attached his pickup device. The similiarities between the body of his electric violin and a known make of silent-violin are striking. A.E. ALLEN and V.A. PFEIL – Orange NJ, USA 1932. Mr.A.E. Allen & Mr.V.A. 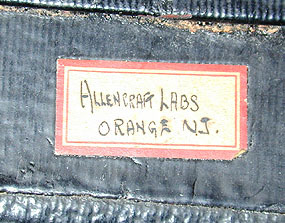 Pfeil (both of Allencraft Laboratories, Orange, N.J.) have developed a complete set of stringed instruments (both bowed & plucked) much on the same lines as the Vierling instruments. Professor V. KARAPETOFF Cornell University – date unknown. This instrument is included as a visual record in the Oxford Companion (1978). The cello seems to have no resonating chamber, the body looks like a thin elipse (stick-like) and there is a standard peg-box and pegs. 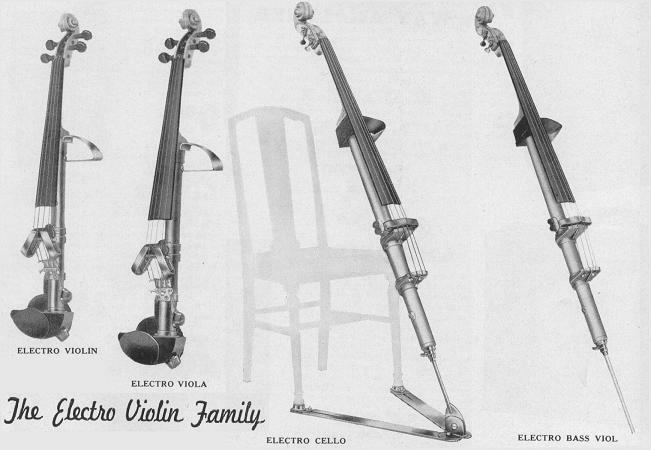 More importantly in one unusual way is that the inventor is seen holding the electric cello. Dr. Vladimir Karapetoff, professor emeritus of electrical engineering at Cornell University at the time of his death in 1948 was a Russian Electrical Engineer and Educator, born in 1876. His work with electronics dates back as early as 1910 and in 1928, Cornell University published notice of a new five-string cello invention. At the time of writing it is not known whether this instrument included an electrical device. No more information currently known. Lloyd LOAR – Acousti-Lectric Co. Kalamazoo USA c1934. The Vivi-Tone series of instruments by Loar included an electric viola and violin date back to the late 1920s. Loar was successfully awarded a patent for his “Stringed Musical Instrument” on 12 November, 1935. George D. BEAUCHAMP – Electro String Instrument Co. LA, USA c1935. Considered by some to be the single most ground-breaking redesign of a violin and overtly pure-electric instrument, George Beauchamp’s Electro violin is today commonly referred to as an early Rickenbacker violin. 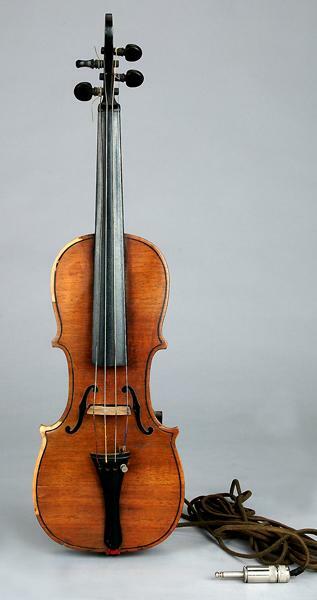 This violin was manufactured by the Electro Stringed Instrument Corporation and as such has connections with what are referred to as the very first successful electrified stringed musical instruments. However, as a commercial project it sold a few dozen units and is very rarely seen or heard today. A few years after launching this violin, Beauchamp redesigned his electric bowed instruments and was awarded patent for a very different design, based on metal frames and wooden necks, launched as the Electro Violin Family. Again though, in terms of commercial success this violin sold even fewer units. INVENTOR UNKNOWN. Padua ITALY c1936. Violin, audible over 8 km. This is the most intriguing violin, probably to remain a wonder and quite a frightening thought. Newspaper reports from Padua and the surrounding area might reveal something. John DOPYERA – NATIONAL DOBRO Corp. Los Angeles USA 1936. More significantly though, the actual maker of this violin is very probably neither menioned above, but by Fredray Kislingbury. The Violectric (aka National) design follows the traditional body appearance, more so than Lloyd Loar’s viola, without f-holes but with a full-depth and hollow body design. The instruments were carefully made and finished to a high-quality. The hidden electrical device is a horse-shoe shaped magnet and coil positioned directly under the bridge which sits on a sprung plate. These electric violins were marketed for a few years and crop up occasionally on the musical market today. Benjamin F. MIESSNER. Millburn, NJ. USA ? c1937. Miessner was born in 1890. He was an American inventor and designer of electro-acoustic instruments. Miessner’s first inventions included some connected with early radio research (from 1909) and (somewhat later) electric gramophones. In 1928 Amperite manufactured an electric pickup designed by him for guitars. After selling his radio patents to RCA in 1930 for a large sum of money, Miessner set up a laboratory to explore further the possibilities of electrifying musical instruments. Around 1939 Tom Adrian Cracraft’s All Electronic Orchestra featured several Miessner-designed amplified string instruments. 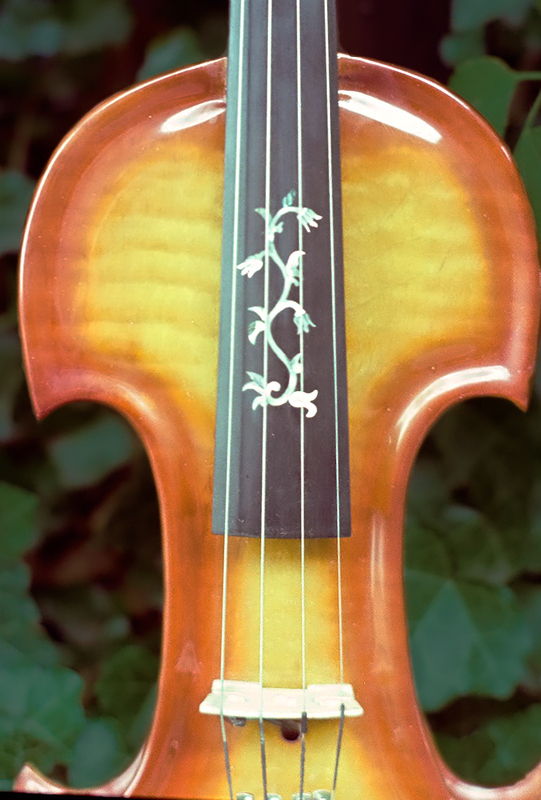 The violin retains a standard looking neck and stop length and also the extremes of both upper and lower bouts are kept. The pick up is a specially designed bridge – more a block than a bridge. The scroll appears traditionally shaped. The cello looks most radical – completely devoid of bouts but with traditional neck and scroll. Discussion of this early period in electric violin making reveals the possibility of a legal battle between Miessner and another new company at the time with Miessner being successfully sued for copying copyright inventions. Marshall MOSS and William BARTLEY. Washington DC, USA 1938. Electrophonic Violin (with belly but no back ). Moss was a violinist of the National Symphony Orchestra in Washington, Bartley, an engineer. The Moss & Bartley instrument follows the Loar instrument in description, the vibrations being microphonically received through a standard(?) bridge and belly and then amplified. Hugo BENIOFF – California, USA c1938. 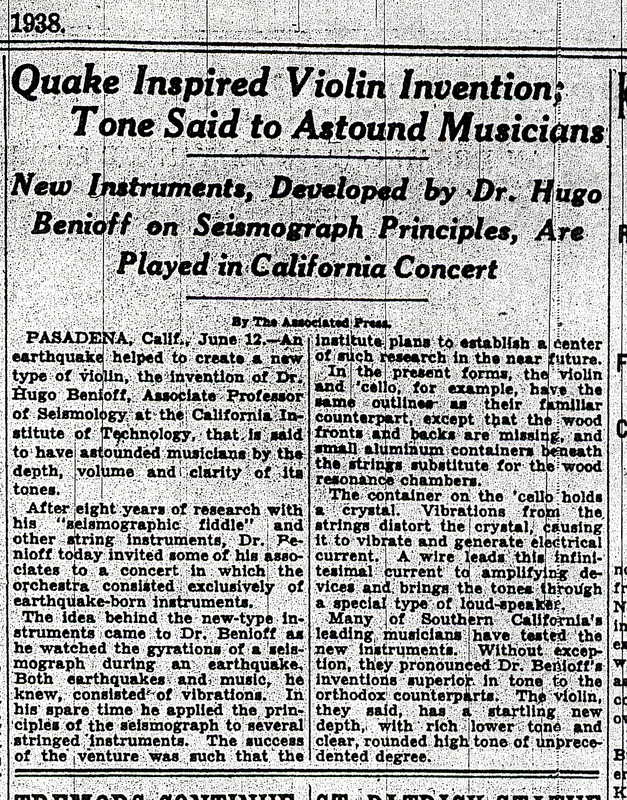 Electro Violin, otherwise referred to as a “Seismographic fiddle” owing to Benioff’s work in the field of geology and seismology. AMPEG Guitar Company. USA 1939. Electric string quartet constructed from clear plastic. The Ampeg guitar company made an attempt to create an entire family of electric string instruments. These were displayed during the 1939 New York World’s Fair. They reportedly lacked any significant tone quality, were too heavy and weren’t very successful. An electrical arrangement applied to a musical instrument subdivides the frequencies of the notes produced naturally and emits the resultant from a loud speaker. NB: details of makers or reports of electric violins or electrical pick-up devices between the years 1945 and 1958 is scant. During this time the violinist Stuff Smith was performing and recording using a Guarnerius violin with a large metal pickup device positioned behind the bridge. Clarence Leo Fender submitted his patent on 02/06/1958 for an electric violin which was granted in 1961. Leo Fender’s autobiography records that the electric violin was tried by a few bluegrass fiddlers at a festival in Nashville but although the sound was considered good, the weight ( almost two pounds ) was a problem. Only a hundred or so were manufactured. The project was shelved until the mid nineteen seventies. The appearance of the Fender electric violin combines elements of previous makers. It looks like a “compromise” between having no body and maintaining a traditionally shaped instrument. The main features of the 1961 instrument are the inner-bouts which appear considerably stretched along their length and the scroll which is a miniature classic-Fender guitar headstock. This idea of instrument design can be seen in some of today’s instruments (ZETA and Bridge Instruments). Barcus Berry – pickups for all bowed string instruments. There are different types. One, a small pickup slotted onto the bridge of an acoustic violin, gives a very immediate and accurate violin-sound. Berry are a big company, distributing around the world. Max. MATHEWS. Bell Laboratories, USA 1972. In the early nineteen seventies Max Mathews developed an electric violin with a separate pickup for each string much along the lines of Compton but positioning the pick up in the bridge, under the strings. Mathews and advocates of his violins (principally Negysey) have contributed essentially to the development of an electric violin technique. The following is taken from a published interview with Mathews. At the beginning of my career I did create a couple of electronic violins. Using Barcus Berry bridges with crystals embedded in the bridge I altered the shape of the violin except for the neck and the area where the instrument sat under the chin. But, after that I pretty much stuck to traditional violin making. I am a banjo performer and instrument repairman now. My name was included in a directory of violin makers at that time by a researcher from UCSC. Thanks for the contact. 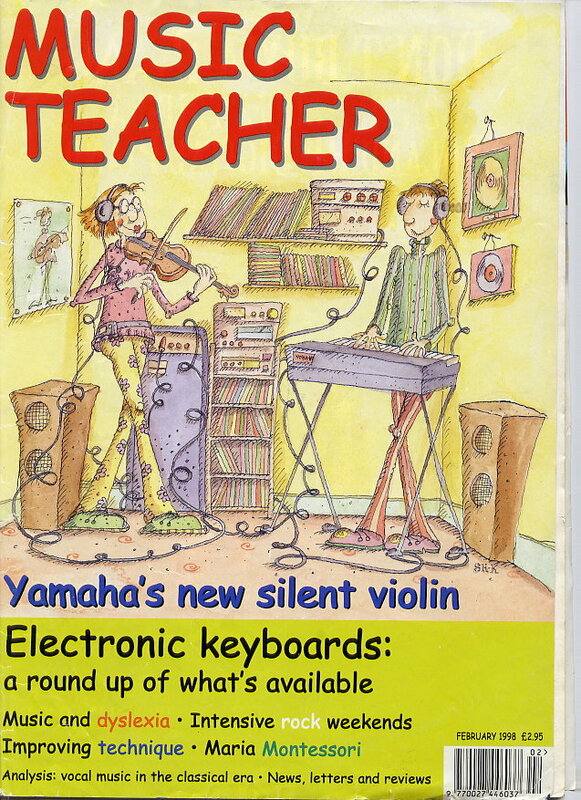 There were a number of makers who pursued the electronic violin about the time I was starting my career in 1969. Some of those instruments came through my shop for repairs years afterward, so I was privileged to hear how they performed. I believe I’m still pretty much convinced that there are venues for the electronic violin, but prefer to work with acoustical instruments. My master worked in Chicago for William Lewis & Son, also for Lyon & Healey. As he lived in an apartment building and couldn’t practice with an un-muted instrument he devised a solid body instrument and hollowed it out to lessen the weight. That gave him a practice violin that made very little sound. A couple of innovative young fiddlers at that time used contact mikes placed under the tailpiece of traditional violins and found that to be satisfactory. With the invention of midi connections for the computers sound could be altered to make any traditional violin sound like almost any other instrument simply by running all the sound through a computer. By running loops a single violin began sounding like an orchestra. I rather lost interest in that process and had a preference to the process of building traditional instruments focusing on the study of affecting tonal qualities by graduating the plates in both traditional measurements and the treatments of the woods. I’m certain that by now there are many who have taken the electronic violin to new heights. I’m not a violinist, my pursuits as a musician were on banjo. I have a pretty good understanding of the acoustics of traditional viols so have made my reputation on that. I’m glad that there are other luthiers who are pursuing the electronic end of the industry. 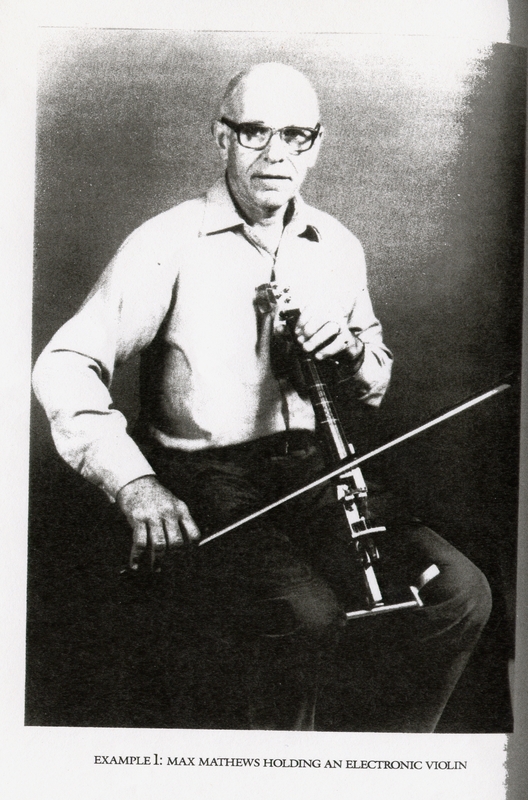 As a young man in his mid 20s, Robert, “Bob” Willcutt, made an electric violin “from scratch” in or around 1974. The violin was commissioned as a gift for a concert violinist to try something different. In 2015, Willcutt located (the only) photographs of his violin and was able to provide the following information from recollection. At the time of writing the whereabouts of this electric violin is unknown. The violin was crafted from one solid piece of Kentucky curly maple, the only hollowness was a long hole drilled through the jack hole to where the pickup wire went near the bridge. Inlay was designed and done by Willcutt’s former wife, Anne Sheen who worked with him at the time. The pickup was a Barcus Berry (“hot spots”? ), at the time considered by Willcutt to be the best choice coupled with their (“redbox”?) preamp. The jack was on the bass side of the instrument so the cord would go over the player’s shoulder. The sides were cove cut so when viewed with the top contours, it looked like a violin’s edge lip, but it was all one piece of wood. This carving of the sides, to make solid wood look like the lip of a real violin but still be all one piece was the hardest part in making the electric violin. It played and sounded fine when a preamp was used. 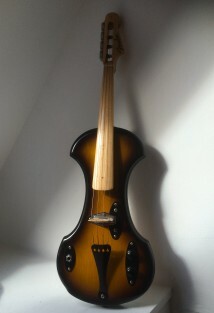 This is the only electric violin Willcutt made. He has created a Brazilian rosewood autoharp, 75 or so dulcimers and countless electric guitars of different levels. Most have been sold. NB – The images here are provided kindly by Wilcutt for Deltaviolin and thought to be the first time they have ever been seen since the instrument was made four decades ago. 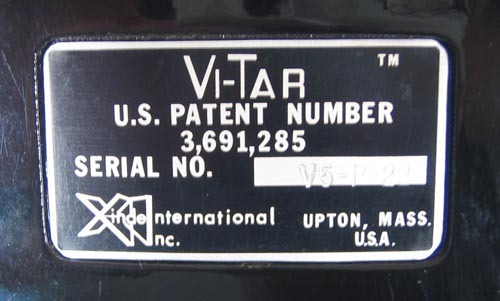 Manufacturer of the Vi-tar or Vitar electric violin. According to Patents, this extraordinary electric violin was invented by Spencer Lee Larrison and filed in 1970. The Patent was granted in September 1972 at a time when the Fender Electric Violin had been relaunched. Since the 1980s the electric violin has grown to be more widely used and possibly even respected instrument. 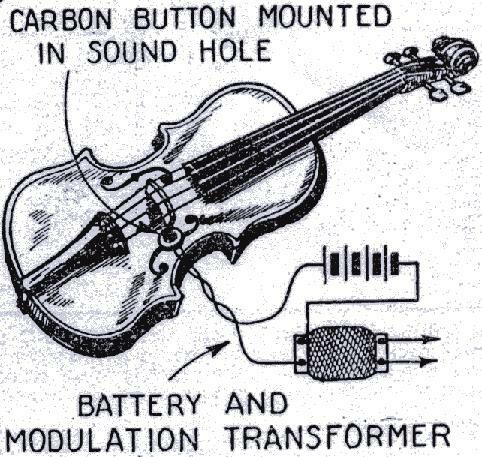 Here are the real roots of the first commercially successful electric violins. ZETA Music Partners. California, USA c1980. Zeta are a major company in the manufacture of bowed electric instruments. Possibly the biggest company to emerge from this period. They now supply different models suiting many types of music – Jazz, rock, country, pop, avant-garde, traditional folk, etc. A Zeta pickup comes with the choice to use digital technology – MIDI (Musical Instrument Digital Interface) – ensuring the Zeta sound can be found in underground and mainstream dance music. It is difficult to conceive of an earlier digital violin. In the 1990s it was been advertised heavily as an ideal educational tool. American String Teacher and The Strad magazines regularly run an advert. Zeta is also by far the most expensive electric instrument on the market. A custom built, MIDI instrument costs about £3000. “Strados” and “Jazz” model violins, violas, cellos and basses (both types upright and slung, recently a “cross-over” instrument) are all manufactured by Zeta as well as spares and processing equipment. Zeta music partners keep the workings of the technology used in their instruments and pickups a closely guarded secret. The bridge design has two small copper-coloured plates set at right angles, across which each string is drawn. It is a device obviously based around the Mathews method of pickup. Each string can be connected to separate circuitry and speakers if desired. The sound is definitely electric, somewhat off-putting for someone looking for a wooden sound. But I think that it is this aspect that stands Zeta apart from all others. The sensitivity that the pick-up works at is almost blinding. In their pickup, Zeta claim to have invented a device which defies the common problem of feedback. The reality of this statement depends entirely on whether an instrument with a resonating body is used. Great problems can still be encountered on stage due to feedback, a problem which seems solved when using the same pickup on a solid bodied instrument. Richard ARMIN – Raad Instruments Incorporated. Toronto, CANADA c1984. Armin received high acclaim from the classical violinists magazine, The Strad. He and a team have produced an instrument that although shaped differently retains important aesthetical points. The pickup device used in the instrument is designed by the Raad team and is considered sensitive to the complex mechanism at work in finely crafted vibrating wood, yet it is designed to withstand the problems of feed-back. A most ergonomically designed musical instrument; the Amazing Electric Violin.There appears to be little collected information about these violins. However, an example of the violin can be seen in an exhibit at the Architecture & Design department at the Museum of Modern Art, New York. From MOMA’s information only a little can be gleaned about this dramatic piece of Lutherie. The instruments appear to be the result of the collaborative work of David Bush, Brian Lepine and Michael Zimmerman. Another figure, Scott Carroll is found in connection with the formation of the Amazing Company. The instruments were manufactured by Bridges Musical Instruments. 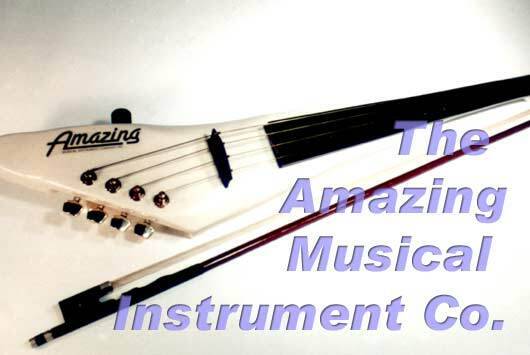 The now defunct “Amazing Musical Instrument Company” was based in Toronto, they made some waves with electric violins in the 1980s and also made a few mandolins, guitars, bass guitars, cello and bass too. 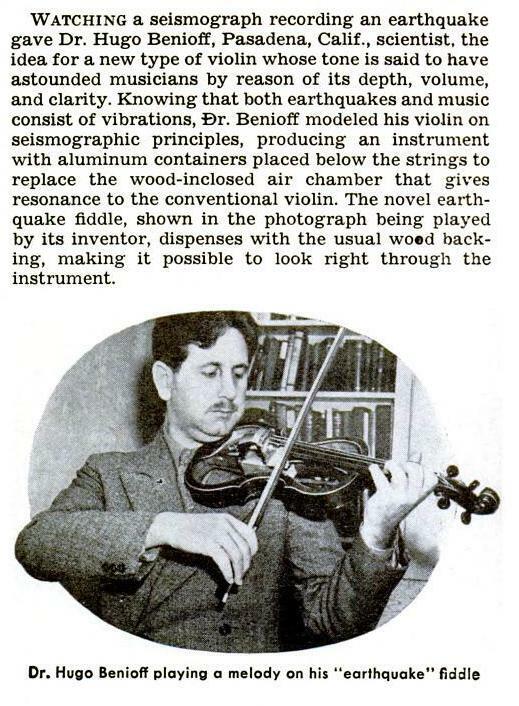 Mention of a design patent for “the world’s most ergonomically correct violin” has not been substantiated. The company folded in or around 1989. In the early eighties, Scott Carroll was one of four founding partners and a key-man in the Amazing Musical Instrument Company. This was one of the first companies to offer the public a truly electronic violin, and a whole line of stylish electronic instruments paralleling their classical counterparts. These instruments were hand-crafted by Michael Zimmerman, a well-respected and seasoned luthier, out of ideal exotic woods to stringent specifications, producing superior base timbres. The proprietary internal tone contouring circuitry and pickup system was designed by Brian Lepine, while production and quality control was carried out by David Bush. Marketing and Sales was handled by Dell Herter. This unique team took the company from the drawing board to capacity production in one year, raising six figures in investment capital from both the government and prestigious members of the private sector. The design problems were new, unique, and challenging. The team assembled was fortunately very experienced in both the scientific and musical side of the many aspects of the problems they took on, being accomplished musicians to a man. Mr. Carroll’s contribution to the engineering side involved analyzing and duplicating the complex behaviour of a real violin bridge on a solid-body design. He had to ensure the coupling and transmission of pure sound quality from the strings, bridge, body, patented resonant sound cavity and sound recording components. Carroll also supervised and assembled key components and circuits, protecting the proprietary nature of the designs. The result of the team’s engineering efforts was a line of instruments still carried today by major music stores in Canada, such as Long & McQuade. Although the company has since changed hands, and the team has moved on to other projects, the instruments have earned themselves a place of respect in the history of new musical technologies, and are valued by collectors. FISHER Industries Incorporated. Geneva, Illinois, USA c1984. The Fischer violin follows the Beauchamp model in appearance being described as having an unusual pyramid shape. It is also available in a 5 string version. 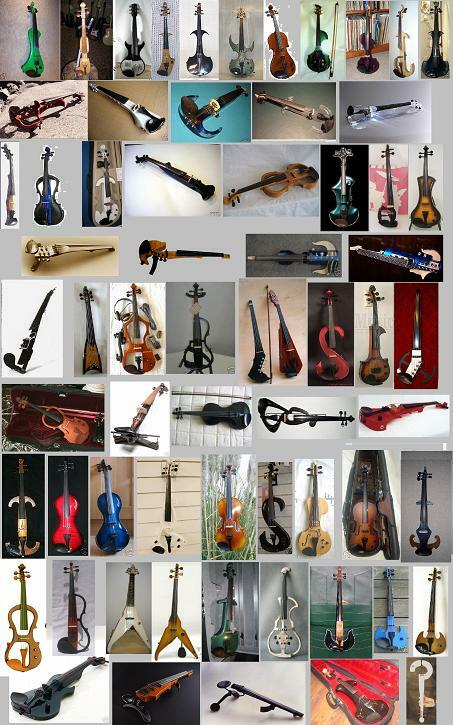 There are a growing number of manufacturers of electric bowed string instruments. Below is an incomplete but rapidly expanding list. Some are becoming well established. The majority of the following are supported with a picture. I have also played a few of the following. Because these makers are around today the list is set out alphabetically. Raad/Miessner type, crafted wood. Talon like scroll and part resonating body. Andy makes traditional string instruments also. He is a Newark-qualified luthier and plays and writes fiddle music. His electric violins come with Zeta “Strados” bridges or Jazz series on request. I tried some of his electric violins and discovered ZETA through a meeting at his house one day. “A multi-element pickup cartridge design (patent pending, 1997), made of rosewood or maple, set in a maple bridge. The pickup cartridge contains an array of independently mounted piezo elements – one for each string. Each element within the cartridge structure functions as an independent pickup which is highly sensitive to its corresponding string’s horizontal vibrations. This is the plane which the bow travels, and where all the rich complexity of sound occur on a bowed string.” information from T.F. Barrett Co.
Warren BOND Enterprises. Worcestershire, UK 1996. Beauchamp-type, crafted wood. Anchor shape with Ashworth bridge pickup. Ted BREWER Violins, Sheffield, UK 1998. 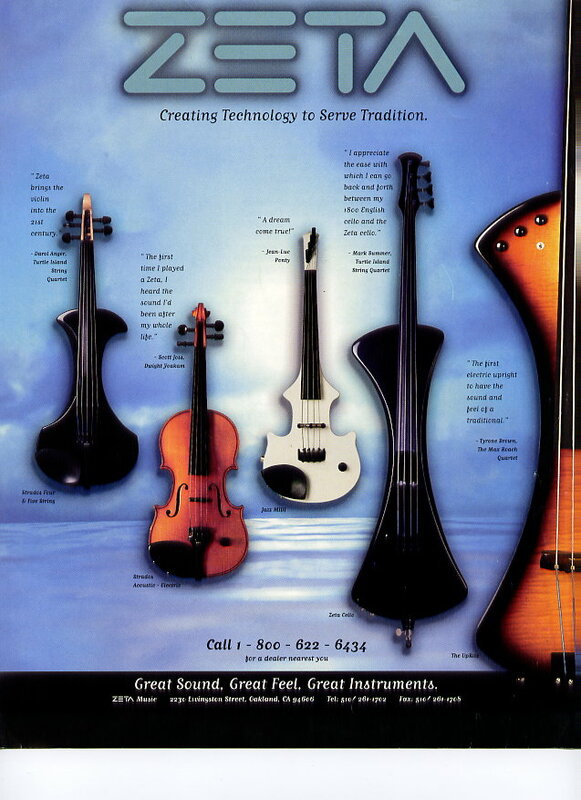 Since appearing in the late 1990s, Ted Brewer has successfully developed an acrylic based electric violin, known as the Vivo. His work has gained serious attention from players and he is firmly established as one of the leading makers of a range of violins in the world today. His design and finish has evolved from a most basic point, every part of the violin has been studied and the end product is very much a fresh and exciting instrument. The following was written in c.1998 and will be re-written as soon as time allows. Ted Brewer’s violins are in a different class altogether. With the advice and help of violinist Jay Brittain (Royal College of Music London), Brewer’s violins are confidently electric. Playing them is something else. The vibrations are acutely felt through the instrument, very responsive and so original. Ted is a wild person channeled through a very sensible head. He has swiftly moved from a self professed innocence to a passion to create the whole quartet. Since simple and humble beginnings, working very much from home, Brewer’s instruments are now manufactured on a significant scale. Bridge Musical Instruments, Lincolnshire, UK 1996. c/o Esther TAYLOR ? Aquila, Lyra, Draco and Cetus – electric violins, violas, cellos and basses. Fender type, thinner and hollow, moulded carbon fibre with traditional wooden neck, finger-board and tail piece.. Piezo-pickup device used was designed for the instruments. Surprisingly deep, rich tone for a mainly non-wooden instrument (the first non-wooden violin that I have tried admittedly). The instrument is light–weight and very comfortably balanced. There is a new model now featuring slight changes to body design. Paul C CLIFF. Manchester, UK 1995. (Strong) Miessner type, almost identical in uncustomised-state, crafted wood. Stick-like with Ashworth bridge pickup and electro-magnetic pickups designed by Paul Cliff. Custom builds to order. One model mounted with 4-string Zeta pickup, neck stop length extended by graduating the stop rather than using the traditional right-angle. There is no upper-bout certainly allowing much freer access along the string length. 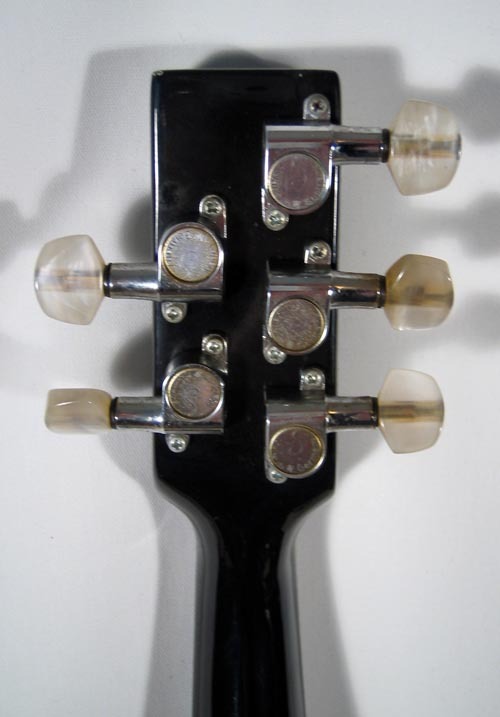 The scroll is after the plain electric guitar headstock (flat, rectangular, with four machine heads). It is reasonably heavy. Beauchamp type, crafted wood. Stick-like, looks like one long neck with a reduced neck stop. A very slender instrument. The underside of the neck traces a line which brings it to not much below the bridge. On a traditional acoustic violin, if the neck were to continue at the same degree its underside would meet the feet of the bridge. A natural alteration of one of the significant standard features of many violin type instruments? In the Jensen violin the fingerboard not so much ends, it falls away near to the bridge. A very beautiful looking instrument. Almost identical to the Strados Zeta violins. Oakwood Instruments. Leeds, UK 1997. The violins come as various stringed options. All are of the Beauchamp (first) type, crafted wood. Stick-like appearance with Ashworth pickup, traditional neck and stop. No shoulder bout. Similar to the Jensen violin. Andrew SCRIMSHAW. London, UK 1996. Electric violin, viola and cello. (Weak) Beauchamp/ Miessner type, crafted wood. Axe shape, with shoulder bout portion. Another electric violin using Ashworth bridge pickup. Skyinbow – Shetland Isles, SCOTLAND c1992. Loar type, crafted wood. No f-holes, acoustic body design and traditional bridge with Fischman pickup. There are different models, one being a cross between a skeletal instrument and a Loar type design avoiding some of the feedback problems associated with other electrified violins. Although very much like a traditional instrument, some early Skyinbow models are slightly heavier. 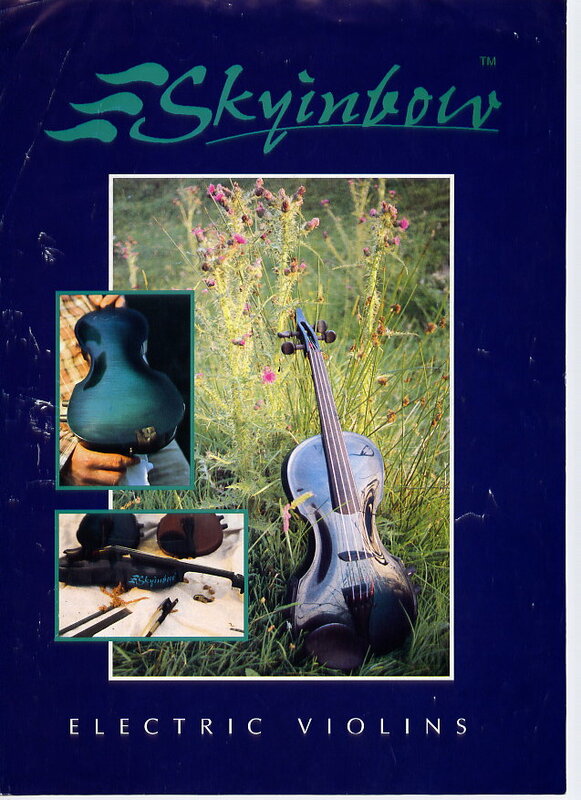 The first Skyinbow instruments suffered from the problems of feedback, but played in suitable settings, within a certain volume range, the instrument has a powerful and immediate, traditional wooden tone. The design and finish is bold. The scroll maintains the traditional peg-box but tapers away rather than curl up. The body of this instrument is so responsive that even with the ZETA pickup in place the instrument still had severe feedback problems at volume. Another draw back, contradicted in the advert is access to the internal workings. Repair work is almost impossible being confined to one ‘key-hole’ entrance. Without drastic measures – e.g. 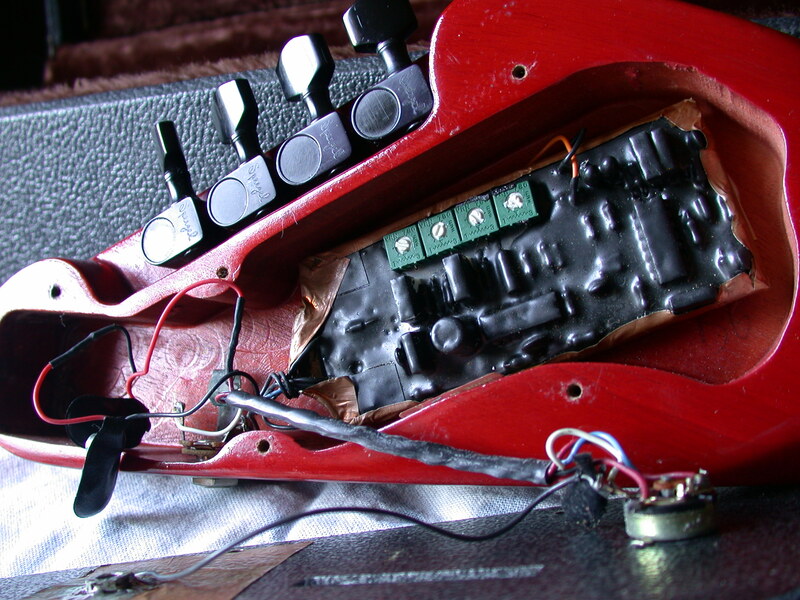 cutting through the finish to access the pickup – this is something that better relies on not going wrong. Since the first models, Skyinbow have developed their range of instruments and have become one of the leading manufacturers of electrified violins on the market today. They are a popular choice. Starfish Designs. Mike ANDERSON – Inverness-shire, SCOTLAND 1990. Vaguely Beauchamp-type. Skeletal/anchor shape design. The photos of the violin and cellos offer the electric violinist a stunningly attractive instrument to play. Stingray, Octopus, Dolphin, Barracuda are names given to the different instruments of the family of bowed strings. Beautifully, customised, hand-built instruments. Unfortunately being located by Fort William, Inverness-shire poses some considerable logistical problems. These look like they are worth the trip! At a glance the instant visual feature is the holes running the length of the body to the neck. These instruments look like they are made from wooden mechhano and have attractive appeal being charming to the eye. Specifications and details obtainable directly from Mike Anderson describe an instrument that is undoubtedly of a high quality, trustworthy performance and remarkable value. The only element of this instrument provided by anyone other than Starfish is the fitting of the electrical components. Again the name Ashworth appears. One source describes the sound from the view point of the instrument maintaining versatility, a good tone and a pure sound in both quiet and loud volumes. Ned STEINBERGER. Nashville, USA c1996. In terms of creative thinking, consistency and originality of idea this electric violin one of the violins of the next millenium. In terms of competition there is really very little. Ted Brewer immediately springs to mind but in a different way. This instrument has endless potential. Arguably, the only violin to abandon every traditional, visual and physical reference to violins beyond being strung with strings and played with a bow. The early instruments seen in photographs look like short sticks connected to a padded tripod. There is very little at a glance that would reveal Steinberger’s design to be a violin. It is loosely of the Beauchamp#1 type – mainly that it is made from a chemical/synthesised compound, is stick-like, without a scroll and the “pegs” (high-tech dials) are located behind the finger board. 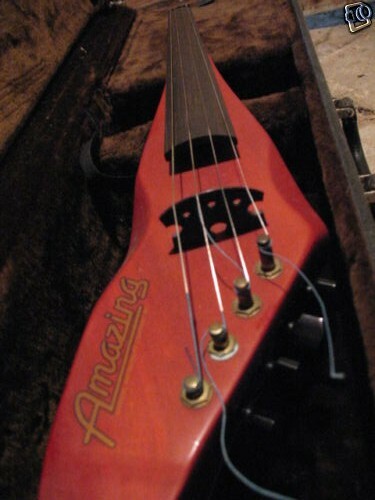 A ZETA 5-string pickup system is used in the earliest models seen. Dazzlingly different. The neck-stop and upper-bout are removable, allowing complete unrestricted access to either end of the string. The whole body in some models stops short just beyond the bridge. The body is suspended by what looks like a curved metal bar connected to the second and almost unique feature – the support mechanism: a tripod, comprising a chin rest, connected to two feet. One foot “stands” on the players chest the other on their back. From recalling correspondence with Steinberger at the time there were no four string versions and the instruments were designed completely around personal specifications. Only about five examples of the VZ-5 were made. One of these made for the International Artist, Laurie Anderson and another, from photographic evidence seemingly for Michał Urbaniak. The support structure is designed so as to isolate the vibrations to be amplified. The only support mechanisms looking and working in this way were invented over 100 years ago. As discussed, there are many patents for methods of supporting the violin. 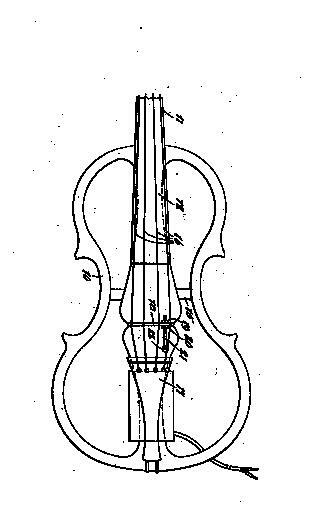 On February 5th 1889, the patent as granted to Lake for a violin support. Basically, it’s “an arch which spans the top of the chest.” One of Steinberger’s violin is supported by a similar looking device. This design in practice gives unparalleled support and steadiness in holding the instrument. In 1996 no instruments had been sold in the UK. With a price tag at $3000 in 1996, it was one of the most expensive instruments on the market. Convincing people of the attributes of high-level design can be hard, yet communication through design is one of the strongest bonds between manufacturer and end-user. Much of my work is speculative; I become interested in certain ideas and then, after the design is developed, I try to connect with the right company to exploit it. For me, this is the hard part! I much prefer to spend my time at the drawing-board. Since the early 2000s, Steinberger has redesigned his series of instruments and successfully launched first the CR series of electric bosed strings, then the WAV and more recently the NXT series. These are highly customisable instruments, including fretting. Steinberger is promoted as the most eminent maker of electric violins in the world today. 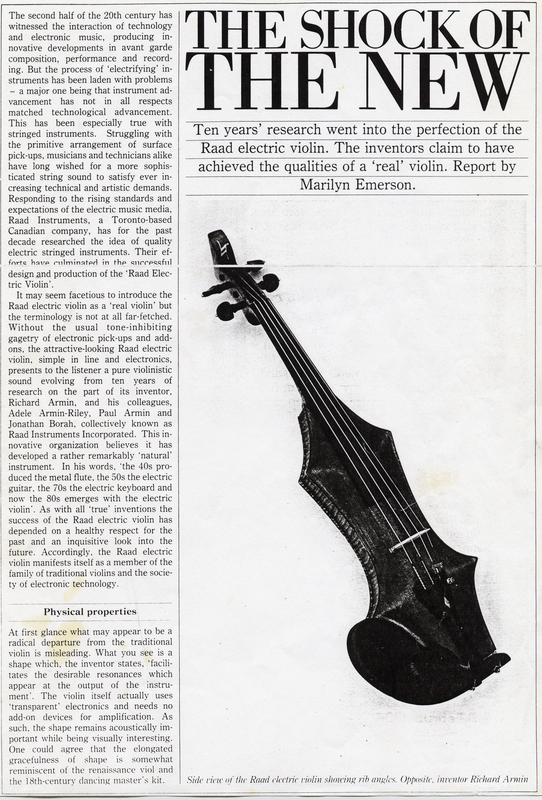 A Beauchamp type electric violin in appearance but nothing more known beyond regular advertisements in the Strad Magazine during a few years. Electric violins, violas and cellos. There is little doubt from the customer list accompanying Violectra that here is a success story. The name of Violectra is a registered design and trademark. In June 1996 David Johnson’s Violectra was pending patent. A very popular instrument which is custom built to order. Nigel Kennedy is often seen using Johnson’s violins and Ponty, Swarbrick and Hartley have given Johnson their seal of approval through commissioning instruments for themselves. 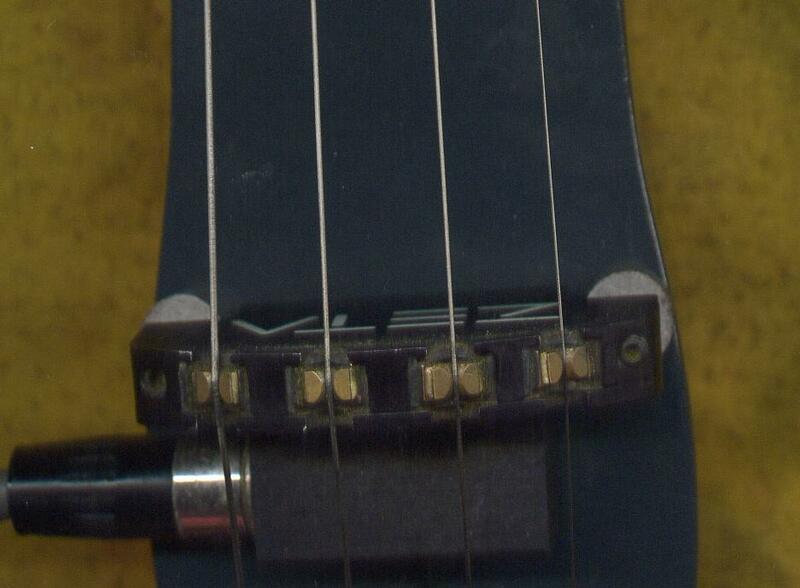 In appearance the Violectra loosely follows Beauchamp’s Electro#1 in locating the tuning pegs (machine-heads) behind the bridge. Johnson uses crafted wood and a skeletal-frame design finished in a variety of colours. As described by Johnson as innovative the wooden-frame construction is striking and looks sturdy. From a technical stand-point the pick-up mechanism used on the Violectra incorporates a piezo-crystal device under each string, the signals of which are combined and passed to a socket underneath the instrument. Violectra’s success appears to be based on the claim that this is an electric violin that sounds and responds like an acoustic violin. This perceived ideal might stem from Johnson’s experience with customer demand but it is not necessarily a sound argument for the electric violinist. Without doubt, Violectra is one of the few long-term success stories in manufacture and sale across the world. Although in many ways this the first electric violin to break-through to the mainstream market is a very exciting development for the credibility of the subject, the first Silent Violin was far from the best electric violin. Yet, this first instrument was flimsy and probably easily breakable. The plastic and wood mixture looked ugly. What is the reasoning behind the half-body appearance, what purpose did it serve and why not make it removable? 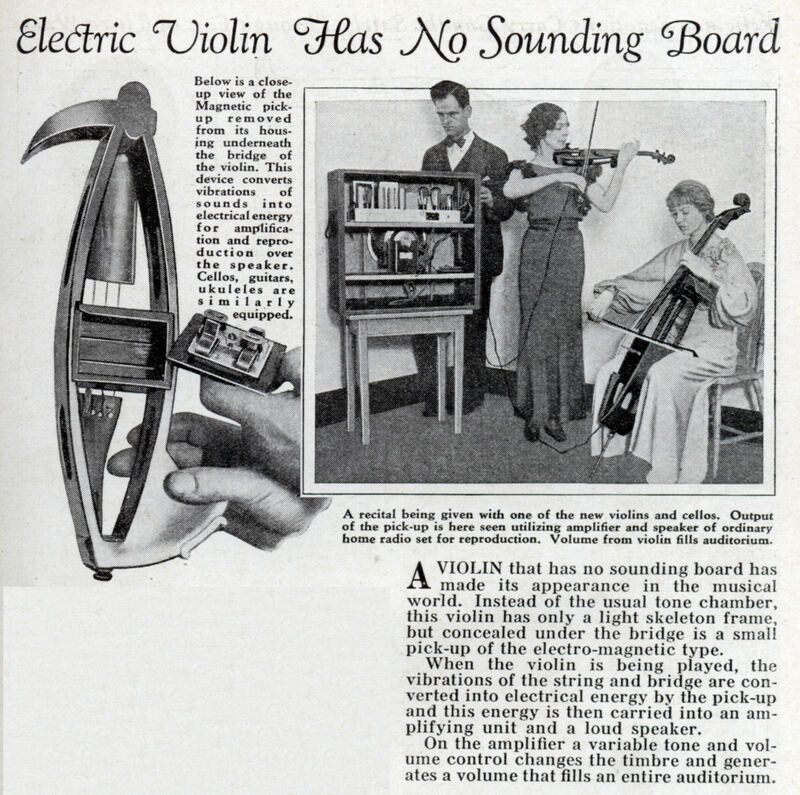 If it were removable the Silent Violin would immediately look very much like a Beauchamp Electro violin#1. There is an immediate and striking resemblance to the Makhonine electric violin from c.1930 yet Yamaha reps claimed no knowledge at all of these early instruments. An affordable electric violin made by a big company, this violin also features a solid shoulder support mechanism. 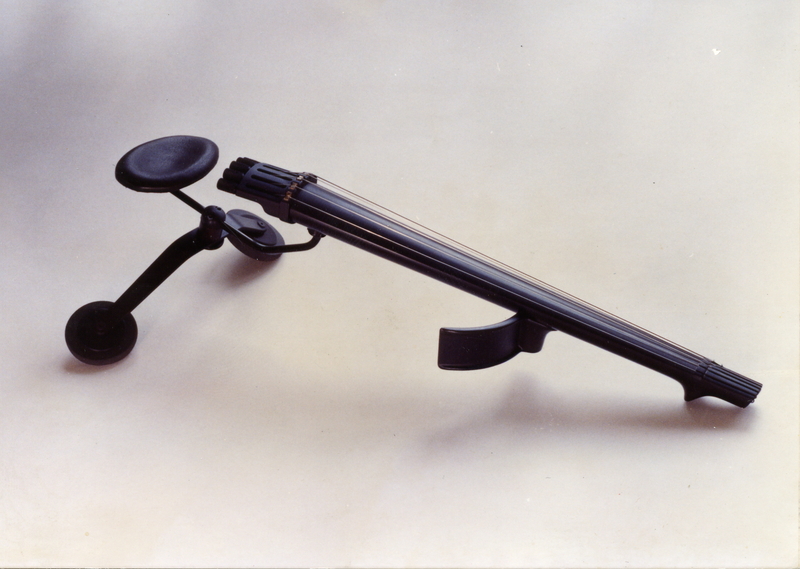 The shoulder-rest device screws into the body of the instrument and once there it is unlikely to fall off – the bane of violinists who rely on support mechanisms. The Yamaha Silent Violin is a stable violin then and with continued development and now with a wide range of instruments from entry level, through student to professional and concert models it has successfully established a significant presence on the world market. The radical Allencraft Labs Electric Violin by Victor Pfeil are about as early as records really begin in 1932; Lloyd Loar’s electric violins appeared as a Vivi-Tone instrument in the early 1930s; George Beauchamp’s Electro Violin from as early as 1935, one of a few dozen ever sold; and Fredray Kislingbury’s Violin appearing as the National brand VioLectric. All only ever sold in very small numbers from an as yet unknown quantity. They sporadically appear on the musical market and promptly disappear again. Specially designed violins with built in pickups and associated circuitry had reached public awareness by 1930. Then, even if only on a very small scale, makers such as Victor Pfeil; Lloyd Loar; George Beauchamp; and Fredray Kislingbury all made electric violins that were manufactured – by Allencraft, Vivi-Tone, Electro String Instrument Corporation, and National. Of these only two, the Electro Violin and the VioLectric ever reached something vaguely like prominence. 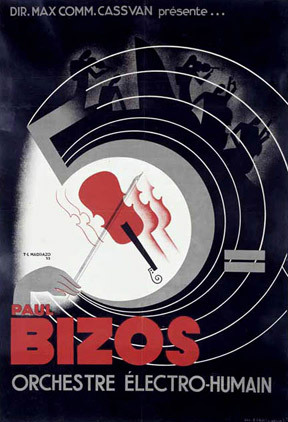 Kislingbury’s violin appeared under the National brand that was advertising as being ‘The Worlds Most Famous Electric Amplifying String Instruments’. 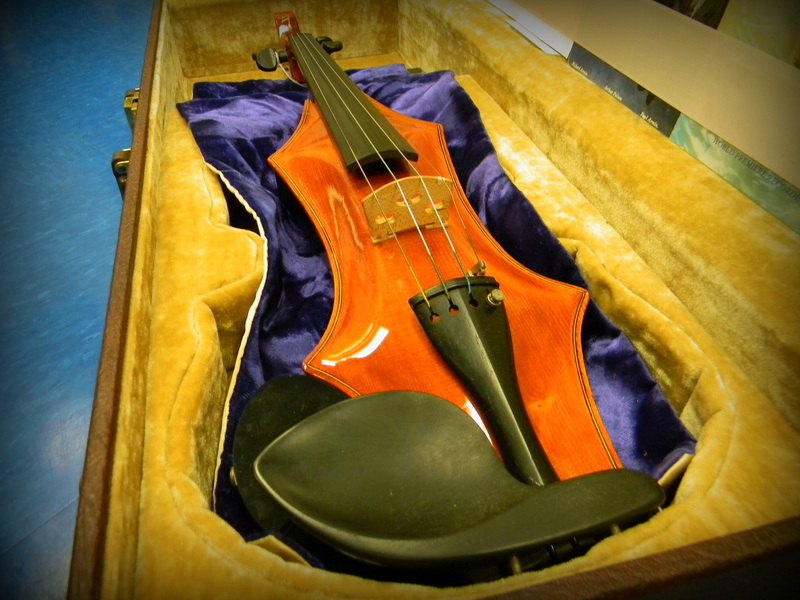 Appearing by 1936, this violin was called the VioLectric and at a glance looks like a traditional acoustic violin. The name is very similar to the current ‘Violectra’ (by David Bruce Johnson from the UK) but is a completely different violin. It could also easily be confused with the later re-released Valco electric violin (via Dopera et al) from the early 1960s. There is a great deal more to the Story of the Violin and some of the instruments are yet to be found, maybe even in a dusty old case under the stairs! Hopefully and one day soon one of the instruments definitely missing from the above links will emerge… until then the Hugo Benioff, Quake-inspired Violin appears lost in time.